This section looks at the courts above the First-tier and Upper tribunals. If you receive a refusal of your asylum or immigration application, and you have the right to appeal, you can appeal at the First-tier Tribunal. If your appeal is dismissed by the First-tier tribunal, you can apply for permission to appeal at the Upper Tribunal. You need permission to appeal at all the courts explained on this page. It is very hard to succeed at this level without the help of a good lawyer. If you were granted permission to appeal at the Upper Tribunal and your case was then dismissed by the Upper Tribunal, you may be able to appeal to the Court of Appeal. This is very tricky without the help of a lawyer. You will need permission to appeal at the Court of Appeal. You first apply for permission from the Upper Tribunal. See the Tribunal website for more information. If the Upper Tribunal refuse you permission to appeal to the Court of Appeal, you can apply for permission directly from the Court of Appeal. See the Tribunal website for more information. If you were granted permission to appeal at the Upper Tribunal in Northern Ireland and your case was then dismissed by the Upper Tribunal, you may be able to appeal to the Court of Appeal in Northern Ireland. This is very tricky without the help of a lawyer. Cases refused by the Court of Appeal in Northern Ireland can be appealed at the UK Supreme Court. The court is divided into the Outer House and the Inner House. The Outer House can hear judicial reviews. The Inner House is an appeal court, like the Court of Appeal in England, Wales and Northern Ireland. If you were granted permission to appeal at the Upper Tribunal in Scotland, and your case was then dismissed by the Upper Tribunal, you may be able to appeal to the Court of Session. This is very tricky without the help of a lawyer. You will need permission to appeal at the Court of Session. You first apply for permission from the Upper Tribunal. See the Tribunal website for more information. If the Upper Tribunal refuses you permission to appeal to the Court of Session, you can apply for permission directly from the Court of Session. See the Tribunal website for more information. Cases decided by the Court of Session can be appealed at the UK Supreme Court. If your case is refused in the Court of Appeal (England, Wales or Northern Ireland) or Court of Session (Scotland), the highest court in the UK to which you can appeal is the Supreme Court (the highest court used to be the House of Lords). Judicial reviews in asylum and immigration cases in England and Wales are usually heard at the Upper Tribunal. Judicial reviews in other areas of law in England and Wales are normally heard at the Administrative Court of the Queen’s Bench Division, which is part of the High Court. Judicial reviews in Scotland are heard at the Outer House of the Court of Session. Judicial reviews in Northern Ireland are heard at the High Court in Belfast. The European Court of Human Rights (ECtHR) is responsible for making sure that member states of the Council of Europe respect the rights protected in the European Convention on Human Rights. The UK is a member state of the Council of Europe, and the European Convention on Human Rights became part of UK law in 2000 (when the Human Rights Act of 1998 came into force). This means that decisions made under UK law (including the decisions of the Home Office and the immigration courts) should respect the human rights in the European Convention. If it can be argued that the UK has failed to protect one of these rights in its decision making, the case could be taken to the ECtHR. The court would judge whether an individual or family’s human rights (as defined in the European Convention) have been violated. If they have, it would weigh up whether that violation was allowed within the normal operation of the government. Some rights such as Article 3 of the Convention (the prohibition of torture, inhuman and degrading treatment) are absolute, which means a government cannot violate them under any circumstances. The court may consider legislation or policy that the UK government has introduced, and it also considers individual cases. 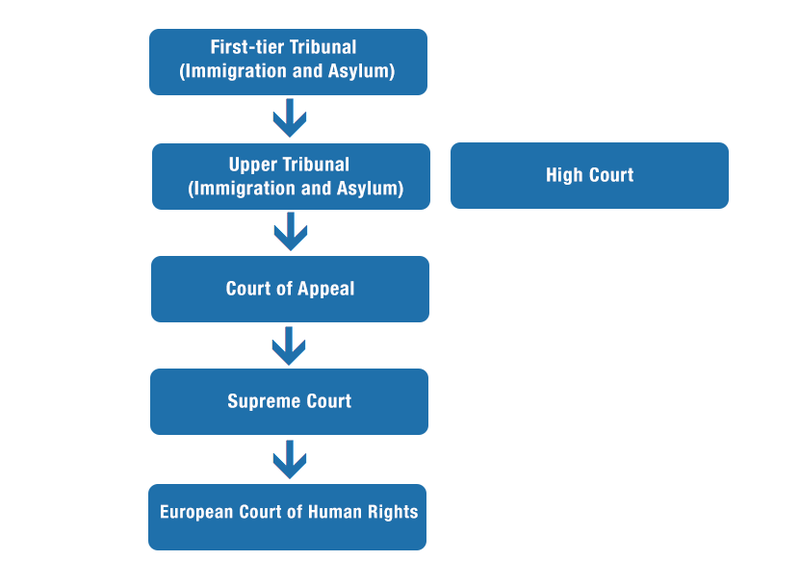 If an asylum or human rights case in the UK is particularly strong or involves key legal arguments which may be important for other cases, lawyers would normally try and take the case to the higher UK courts including the Court of Appeal and the Supreme Court. If the case is lost in the Supreme Court, the lawyer may then apply for the case to be heard at the ECtHR. Individuals trying to get their asylum/human rights cases heard at the ECtHR usually do so after being refused permission to apply for judicial review. If you are considering applying to the European Court of Human Rights, you should read the court’s guidance document. Applying to the ECtHR successfully is extremely difficult. An application is only likely to succeed with a very good legal team. The process of taking your case to the ECtHR can take a long time. If you need an emergency measure to stop removal/deportation, you should apply for Rule 39 to be applied. A Rule 39 application is an attempt to get the European Court of Human Rights to make a binding interim measure on your case under Rule 39 of the ECtHR rules of court. A rule 39 measure is a temporary measure before a long-term decision is made. One of the interim measures the Court can put in place is the suspension of removal from the UK. A successful application (stopping removal/deportation from the UK) would have to show that you are at real risk of serious, irreversible harm if the measure is not applied. If you have been issued with notice of removal/deportation, and you can argue that the Home Office and the courts have not properly applied the European Convention of Human Rights (which the UK is obliged to do under international law), you can apply for Rule 39 to be applied. Read the Court’s Rule 39 Practice Directions here. The European Court of Justice is formally known as the Court of Justice of the European Union (CJEU). The court is responsible for providing advice to national courts about the proper implementation of European law, and ensuring that European law is applied equally across member states. It is very unusual for the European Court of Justice to be involved in individual asylum and human rights cases. A UK court may ask the Court of Justice for clarification on how a particular aspect of European law is to be used.